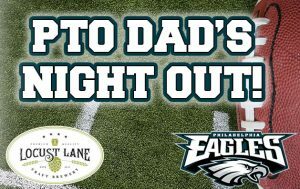 Dad’s Night Out – Eagles vs. Giants! You are here: Home / News / Dad’s Night Out – Eagles vs. Giants! Come hang out with fellow VFES dads to watch the Eagles versus the Giants! Enjoy some craft beverages, eats from the food truck, and E-A-G-L-E-S Eagles! Even better… Locust Lane will give 10% of your tab to VFES PTO! Help contribute to the PTO by doing what you would already be doing… cheering on the Birds! No RSVP necessary, just come out ready for a fun night to benefit the PTO!